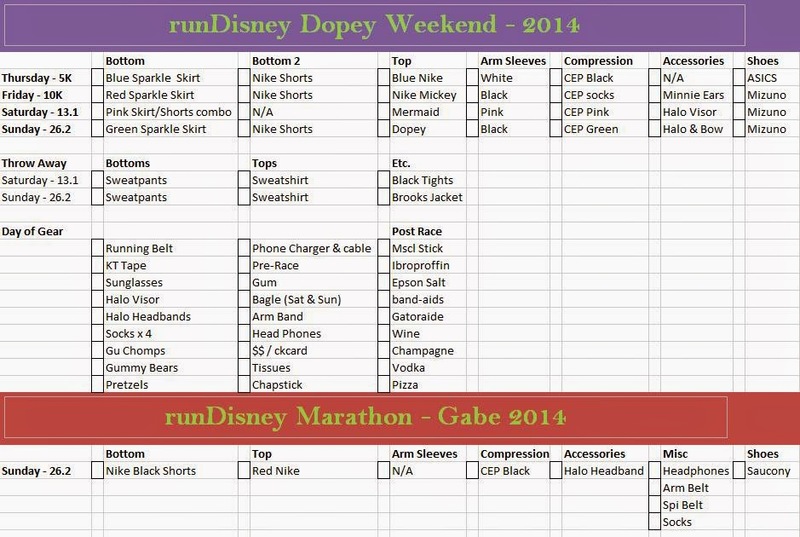 runDisney Marathon weekend is less than two weeks away. Nerves are at a high and I am here to help. I have seen multiple people ask online what they should pack for this weekend and the most common response I have seen is "everything". While that is somewhat true, I have broken it down for you. The runDisney Marathon weekend takes place the second weekend of January in Florida which means weather can be anywhere from the 40's to the 80's (sometimes cooler or warmer!). Welcome to FL! My first tip - bring a carry-on bag specifically for ALL of your running necessities. If you are running Goofy or Dopey, rubber band each day's outfits together, this way it is easily accessible and you don't have to go around scrimmaging the night before. Excel Spreadsheets are key. Break down your outfits by day, rubber-band them together as mentioned above and check off items as you have packed them. Here is a copy of my list from 2014 which also includes the items my husband had to pack since he came up a few days after me. Email me at irun4wine@gmail.com if you want the template! My list has some modifications for 2015. I am happily "just running the full" this year but I learned a lot of lessons from my experiences in 2014. Biofreeze Travel Packets - while I know they have this at med stations, they do run out. Pre-race fuel and nutrition. I always bring a plain bagel and eat it slowly while waiting for the Corals to open. Pack whatever you are accustom to and bring it w/ you to the start line. I bring a water bottle with Cellucor C4 which I drink 15 minutes before my group starts. Mole Skin & Band-aids in case of blisters. It happens - and with 25,000 runners in town, it is hard to find mole skin at the drug stores surrounding Disney. $$ or a checkcard. Once inside of open parks, I found myself wishing I had money for food. Remember to have fun out there. You put yourself through months of grueling training and the last thing you want is a negative experience. runDisney is all about having fun while achieving goals. I never go into a runDisney race with time expectations. Take tons of photos, meat new friends and enjoy this time. No lol. My pink skirt has built in compression shorts. Note - it says pink sparkle skirt under first bottoms. The others are for skirts w/o built in shorts.